Established in September 2014, Gemma Redmond Vintage is an online treasure-trove of vintage and antique costume jewellery and accessories. Customers can browse and buy from this large collection of beautiful pieces, whenever and wherever. Gemma Redmond Vintage prides itself on offering vintage and antique costume jewellery and accessories to suit all budgets, tastes and occasions. Available are signed pieces, by the likes of Chanel and Christian Dior, and unsigned items chosen for their exceptional design. Gemma Redmond is the founder of Gemma Redmond Vintage. She is based in North West England and was born in the early eighties. As someone with an avid interest in learning about the past, a love of the fashion industry and a keen eye for art and design; it was only natural for Gemma to develop a penchant for collecting vintage costume jewellery. Over time, she has developed an extensive knowledge in this field. In 2014, she decided make a major career change, leaving her post as a primary school teacher to turn her hobby into a business. With a degree in History from the University of Manchester under her belt and having completed fashion business courses at Central St Martins and London College of Fashion, Gemma has some great credentials to her name. Gemma Redmond Vintage aims to illustrate that vintage and antique costume jewellery pieces can be worn by anyone, everyday. Within this online store, there are not only items for brides and pieces that can be paired with eveningwear, there are items to add colour, detail and, most importantly, originality to casual looks too. Encouraging others to celebrate the uniqueness of vintage costume jewellery by wearing it anytime and anywhere, is something that Gemma is passionate about. She writes and edits a blog which aims to extoll the virtues of wearing vintage fashions in contemporary ways. Each piece of jewellery sold here at Gemma Redmond Vintage has been hand selected by Gemma herself from locations around the world. Items are chosen for their wearabilty, craftsmanship, special design, eyecatching colour, condition, prestige and back-stories. Indeed, Gemma is very particular about including items for the way in which they evoke the time periods in which they were made; for the way in which they reflect the skill and characteristics of their designers; and for the way in which they can compliment one's personal style. Since its launch, Gemma Redmond Vintage has grown from strength to strength. The company and its jewellery have been featured extensively in the press. Magazines, such as Love, The Sunday Times Style and Unveiled, have selected pieces from Gemma Redmond Vintage for their high end editorials. Publications, such as Vogue and Elle, have invited our brand to advertise with them because we are suited to their fashionable readership. At Gemma Redmond Vintage we have also established an extensive list of happy clients, which includes celebrities such as Strictly's Karen Clifton, Soprano Laura Wright, model Nadia Forde and the Antiques Roadshow's Judith Miller. The company is also a firm fixture at select antiques, vintage, bridal and gift fairs across the country. Our jewellery is now also sold on Etsy and Open for Vintage too. The business has also evolved to offering a Personal Shopping service, gift vouchers and an exclusive members club, for those as passionate about vintage costume jewellery as we are! Finally, Gemma has built a reputation as a vintage costume jewellery expert. Her jewellery features in the prestigious Millers Antiques Handbook for 2018-2019 and she is credited as being a consultant for the book. She has written articles on the field of vintage costume jewellery for Vintage Life Magazine and Antique Collecting Online. 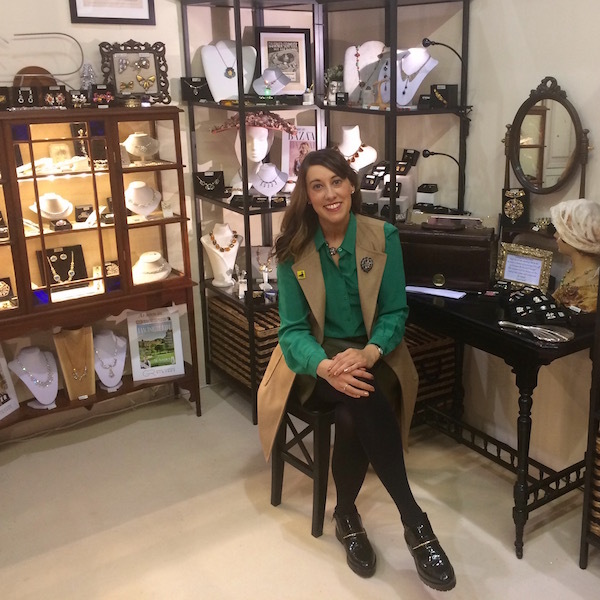 She is the resident jewellery expert for Vintage Explorer Magazine and delivers talks on the subject too. She is also a member of the Antiques Young Guns - an organisation for young dealers within the UK. We hope you enjoy exploring the wonderful world of vintage and antique costume jewellery and we thank you for choosing to shop at Gemma Redmond Vintage. If you would like to receive regular updates about our company and the items that we stock, please do sign up to our mailing list or follow us on social media.